I’ve been thinking about the books I could be reading in 2016 lately, especially as I didn’t get any for Christmas for a change! I’m not sure if it’s a good thing or not: on one hand, you never know what books people will give you and you may either love or hate it; or on the other hand, if you ask for specific books, you know what you’re getting but it’s a bit less exciting. Books are just so personal! At Christmas, I went for the option of giving adult colouring books to two of my friends because I could choose themes they’re into and it’s an easier choice than picking a novel I like or think they may like! I am determined to get these books finished this year because they’ve been a bit hard to get through and I keep dipping in and out! I suspect they may not be the easiest of reads, but I need to get some classic novels into the mix in 2016! I haven’t seen any new novels which I want to read yet, despite having a browse online and in my local bookshop at the weekend. Usually, when I pop into a bookshop when I’m not seriously looking for anything, I find loads that I want and I buy them. Then, on days when I’m seriously looking for books to read, I find nothing! Never mind, I’m sure I’ll find something new to read soon, and in the meantime, I’ll crack on with the above lists! Yesterday, I ordered some books from Amazon and they arrived today! Now, before people start telling me I should support my local bookshops and all that, I must point out that the nearest decent bookshop is a good 15-20 minute drive away from my house and parking isn’t free, and the last few books I’ve bought have actually come from bookshops! I try to alternate between online stores and bookshops! 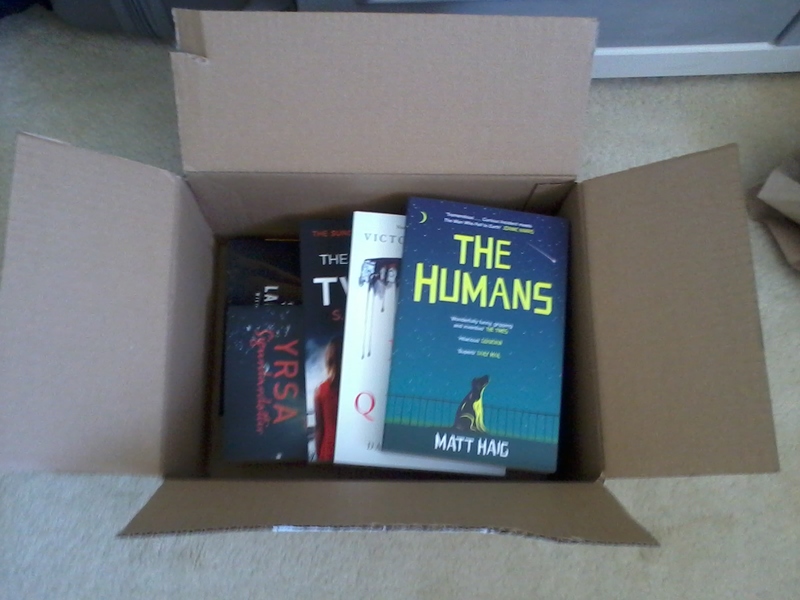 My main reason for buying online was needing to get some books for my mum’s birthday fairly quickly! 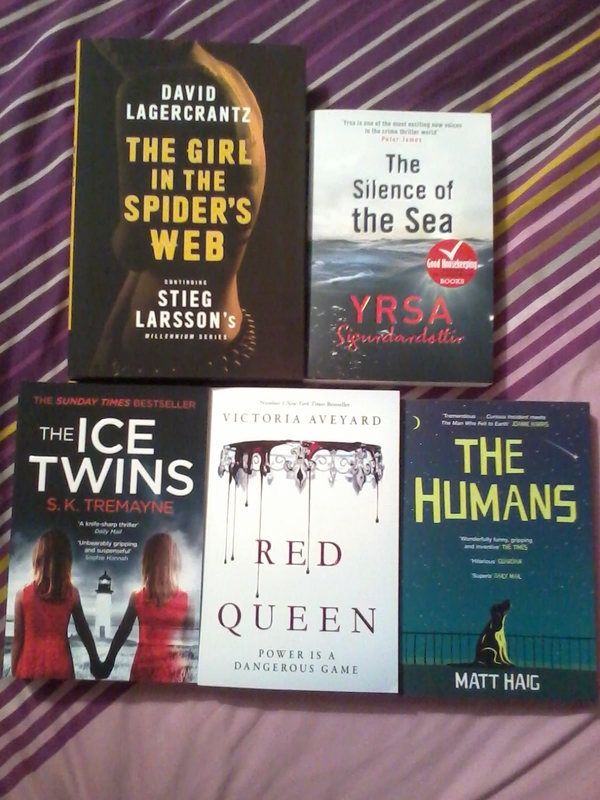 I also have some birthday money to spend and I’ve been wanting some new books for a while! The top 2 are the ones I’ve bought for my mum, picked from a list she gave me. I actually want to read “The Girl in the Spider’s Web” because it is the continuation of the Millennium series by the late Stieg Larsson, although at the same time I sort of don’t want to read it in case it ruins the series! I’m not really sure what “The Silence of the Sea” is about but I may or may not read that once my mum has! The 3 bottom ones are my choices! I like books about twins so “The Ice Twins” sounds fascinating. “The Red Queen” is one of these YA novels which is a fantasy that could be big like “The Hunger Games” or “Twilight” and sounds a bit like “Noughts and Crosses” by Malorie Blackman. “The Humans” just sounds like it could be funny and a bit weird with aliens in it. I have no idea which book to start with but I’m looking forward to reading them! Yesterday, I met up in town with one of my close friends, who I met during my Masters degree and with whom I share a love of books, bookish things and random things. In the run up to this meeting, I popped into The Works to look for a present for my friend as it was her birthday recently. The Works has become my current favourite place to get some book bargains, and I spotted two cool little craft books in there which I just had to buy. It seems to have improved lately as I’ve found a few good deals in there recently! I don’t usually buy that many non-fiction books, aside from the occasional book on the English language, so this was a novelty for me! The Works is great for slightly obscure and random books on pretty much any subject! This is the book I gave to my friend for her birthday! 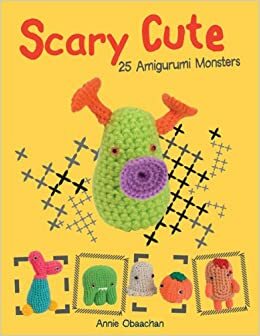 It’s full of projects to make using a type of Japanese crochet, all in the shape of cute little monsters! She loved it and wants to try out some of the projects! 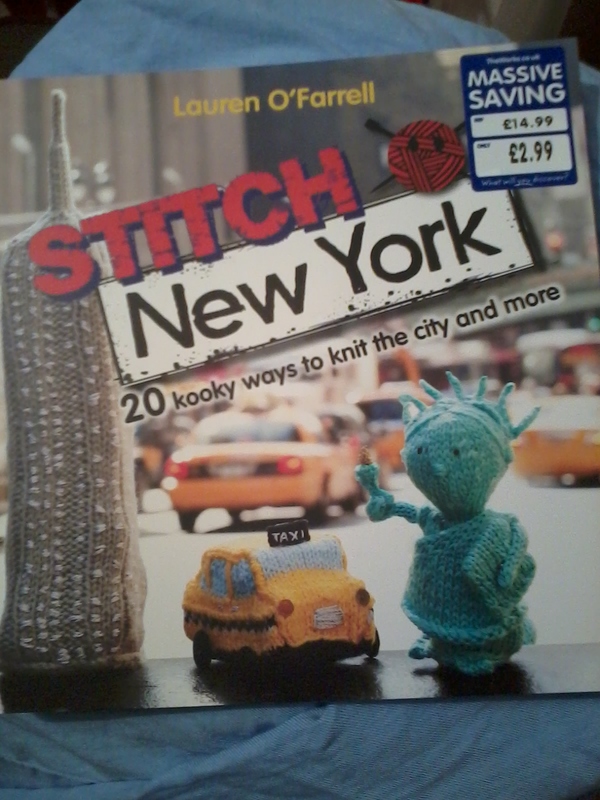 This is a really cute little book on how to knit little projects relating to things you find, such as the Statue of Liberty (like on the cover! ), hot dogs, the Empire State Building, and many other random things. I’m not that great at knitting, but I would love to try something new so this looks like fun! I wasn’t supposed to be buying more books, but their stock is cheap enough to make it worth it! And I have the excuse of buying a present too! So, that’s it, I’m not going to buy any more books now until I’ve read the ones I’ve already got!